The lodging facility closest to the sometimes-neglected Northeast Entrance, Roosevelt Lodge and Cabins doesn’t get nearly as much visitor traffic as other parts of the Park. Nonetheless, even though it’s an ample drive from any major thermal area in Yellowstone, it’s still worth the trip in our opinion. It offers something you can’t get elsewhere in the Park. Indeed, large part of Roosevelt Lodge’s appeal goes toward the mystique of its namesake: President Theodore Roosevelt, who undertook a much-publicized tour of the Park in 1903. Indeed, Roosevelt Lodge has popularly been held as resting on the site of the President’s camp in the area. In reality, when traveling near the Lamar Valley, he camped closer to Calcite Springs Overlook, up the road. Yancey was of that frontier type, which is no more to be seen; the goat-headed, shrewd-eyed, lank Uncle Sam type. He and his cabins had been there a long while. The legend ran that he was once a Confederate soldier, and had struck out from the land of the Lost Cause quite unreconstructed, and would never wear blue jeans because blue reminded him of the Union army. He was known as Uncle John by that whole country. One of his cabins was a rough wayside inn for miners traveling between Cinnabar and Cooke City at the northeastern edge of the Park. Yancy did not talk much to mere people; and I should have been mere people to him, but that I knew Boies Penrose (later Senator from Pennsylvania), who had camped more than once on Hell Roaring Creek nearby, and for whose good shooting, fishing, and horsemanship the old timer had warm respect … He had some sort of fermented stuff made from oranges, which he obtained from California. Mingled properly with whisky, the like of it I have never elsewhere tasted. There’s another Roosevelt connection to Yancey, besides Yancey’s proximity to the present lodge. John Yancey died of pneumonia May 7, 1903, several weeks after trekking to Gardiner to witness the laying of the Roosevelt Arch’s cornerstone—and to see the president speak. Reputedly, they even met and shook hands. Besides Yancey’s lodging was available at the Roosevelt Tent Camp established by Wylie Permanent Camping Company in 1906. 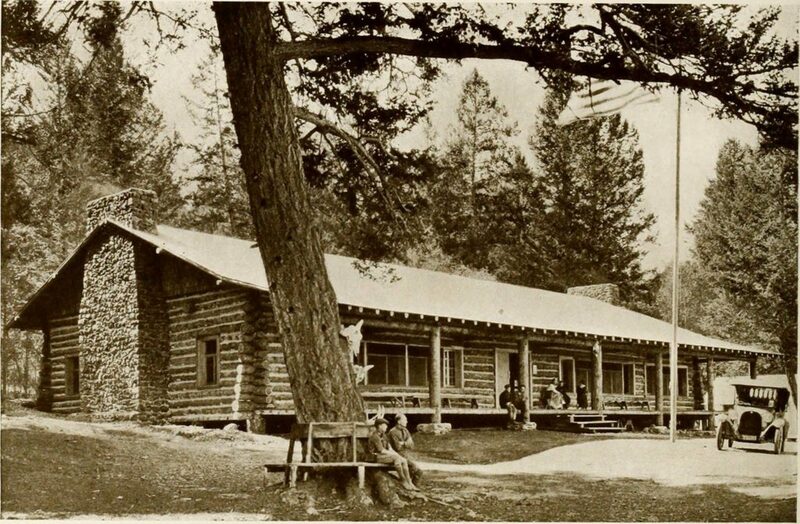 In this way, the establishment of Roosevelt was quite similar to the development of Lake Lodge and Old Faithful Lodge—former camps that changed over to cabins after the camping companies were consolidated into the Yellowstone Parks Camps Company. Roosevelt Lodge was constructed in 1920 and, with the exception of the loss of tent cabins, hasn’t visibly changed over the years. It very much retains its original character, borrowing a bit from T.R. The roughshod, slightly decrepit image of Yancey’s is nowhere to be seen. The Dining Room, for instance, is distinguished rough-wooded walls, and for the untreated logs used as pillars, which visitors can admire as they’re treated to lemon sage chicken or sirloin. You can also grab a drink from the bar, just inside the entrance. The cabins, meanwhile, offer some of the most affordable lodging experiences in the Park, although they may lack in material comforts for some. At the very least, however, visitors won’t wish to “remember but never revisit” Roosevelt Lodge. Best of all of the is the porch in the front of the main lodge building, where you can recline in a rocking chair and watch the scenery—well, most of it. You still have to reckon with a bit of parking lot.